When you are consistently looking for business, sending out the right signals and asking the right questions on a daily basis…there will never be a shortage of Buyers who need you. You will definitely find them. Here’s a pleasant realization… The challenge is not finding prospects to work with… The challenge is this – “Who will I choose to work with?”. In other words, put yourself in a position of being selective. You can easily be in charge of what Buyers you are going to share your skills and your knowledge with. You now have to decide… Who deserves to stay on “my conveyor belt”? At this point it becomes obvious that you can’t work with everyone – more importantly, you shouldn’t try to work with everyone. This isn’t a “one size fits all” business. So how do you decide? 1. The Ability to Buy… Are they in a position financially to make the purchase? 2. Motivation… Do they really want to go ahead? Are they a now Buyer or a “looker”? 3. Realistic Expectations… Does what they’re looking for exist in the marketplace? Your job is to educate them about the realities of price, value, and availability. 4. Timing…Do they have a sense of urgency? Avoid those individuals who say that “we are not in a hurry, you know”. Keep them on your longer-term follow-up list – you are looking for those 30 – 60 day Buyers. There’s nothing wrong with being selfish with your time. Think of your overall objective – why am I in this business? Does this Prospect meet my standards in working towards my ultimate goals? Now comes the tricky part – should you start off this way or should you or your standards into you get busy? The best Salespeople have high standards right from the start. Let’s face it… You don’t go to the doctor after you get healthy, right? Have the confidence to say no sometimes. Here is your Action Step…Unless this is your first day as a real estate Salesperson it’s probably prudent for you to do some housecleaning. Who should you get rid of right now? Everyone you work with should pass the above 5 criteria. 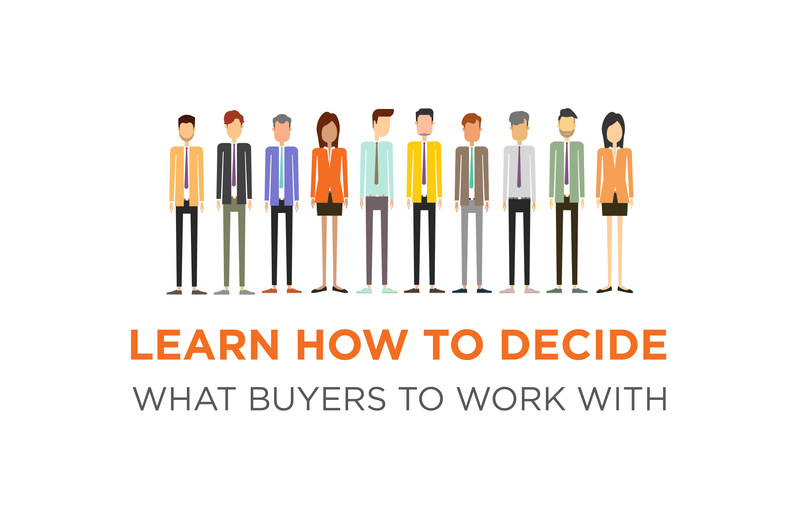 Decide to only work with Buyers who meet your minimum standards. If they don’t, then do yourself a big favour. Cut them loose and spend time looking for someone who does meet your standards. Don’t try to fit a square peg into a round hole. The only reason that real estate Salespeople work with unsatisfactory buyers – the “time vampires” – is because they don’t have better leads. You are in charge of your success. It starts by choosing the right people to work with. Take the time every day to prospect for Buyers you want to work with. Don’t forget to “treat yourself with respect” – you deserve that. NO Excuses.